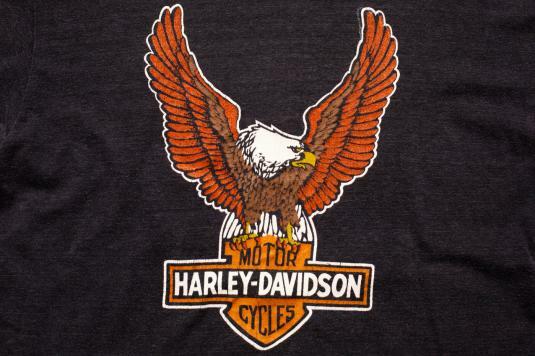 Rare true vintage 1980s Harley-Davidson eagle logo t-shirt from Phil Peterson's in Miami, Florida; made in USA. It is a see-thru thin 50/50 blend Mayo Spruce tee. The shirt is in very good vintage used condition with some wear, pilling, a few small stains on one sleeve (seen in last pic), a name written on the tag, and some cracking on the graphics.